Ghosts, revenants, incubi , vampires and demons haunt medieval England, as Yolande and Geraint must use their love to survive. Yolande is half Ethiopian and wonders around the medieval British countryside dressed like a man using her Saint Sebastian bow which is blessed and her knowledge of herbs to exorcise evil demons and bring peace to the restless dead. She must remain chaste for a time of seven or endanger herself to possible possession by a demon. Until she meets the entertaining and charming Welshman, she has always worked alone. While their bond grows, so does the danger in which they put themselves. Geraint is a Welshman who earns his living by juggling and entertaining, but he is smitten with the fierce, but lovely, Yolande and determines to travel with her as her protector. But the 1300’s is a time of mistrust and danger to those who are different. As they travel from place to place, they occasionally fall under scrutiny and suspicion from villagers as well as the evil spirits they have come to hunt. Even if they survive villagers, evil spirits and the undead, will Yolande and Geraint ever find a way to have a normal life together? I found the exorcisms and release of restless dead exciting and interesting. Dark Maiden isn’t just about exorcisms, however; it’s also about human nature and the distrust of anything and anyone who is different. Yolande not only looks different, but acts different. I liked the way Ms. Lindsay Townsend handled those differences without coming off preachy or making it the focus of the story. Ms. Townsend creates believable characters with purpose and motivation. I particularly liked the character of the Welshman, Geraint. His devotion to Yolande, his innovative ways of showing her how much he cares about her and respects her, and his bravery really made me care what happened to him. Sometimes I felt some distance with Yolande’s character and she didn’t seem to reciprocate Geraint’s regard to the same degree. Dark Maiden is filled with beautifully constructed and layered scenes that make the reader feel they are part of the story which I have found to be Ms. Townsend’s trademark. Dark Maiden is a delightful story filled with historical details that make the reader feel they’ve taken a step through time. 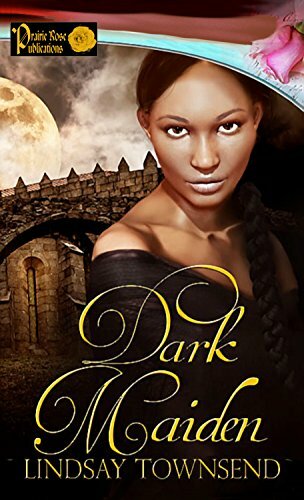 Readers will thoroughly enjoy Ms. Townsend’s Dark Maiden. Here's two new excerpts, the first from Yolande, my exorcist, when she meets the dangerous Geraint, my anti-hero. Here's the second excerpt, this time from my hero's point of view. The abbot… moved to the crucifix, bearing it aloft and tucking it safely into the crook of one arm. Will he sing it a lullaby too? He stopped, mainly because he had run out of English words for the moment and his mind was filled with indignant, furious phrases in the Welsh. He also wanted to see whether Abbot Simon would answer. Good information. And the author is using the different way of writing format and quality information. New information and guidelines are improving the skills. I am writer at custom essay writing service and this information is changed my writing styles. I am very happy to see this type post and I will share this article on my personal blog and friends. I am sure they will get new information and ideas from this post.